With their bright pink coloring and long, curved necks, flamingos are some of the most recognizable birds in the world. But do you know why flamingos are pink? Have you heard about the unique way they feed their young? Or the way they recognize their children, despite their poor sense of sight? Let’s find out with these facts! What do flamingos look like? Flamingos have pink feathers, long legs and necks, and hooked bills. Their appearance is unique and easy to recognize. There are six species of flamingos, but most share similar characteristics. Their long necks are S-shaped, and they also have webbed feet. Flamingos have black-tipped bills and are large birds. For example, greater flamingos are 36 to 50 inches tall with a wingspan of 60 inches. They weigh nearly nine pounds. Flamingos are water birds, so they can be found near lakes and lagoons. The American flamingo lives in the Galapagos Islands, Yucatan, the West Indies, and northern parts of South America. 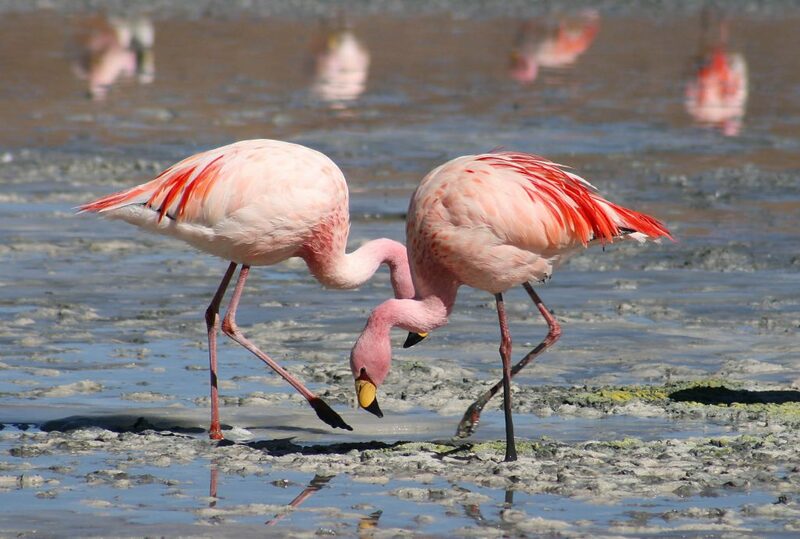 Chilean, Andean, and James’ flamingos can be found in South America. Greater flamingos live in the Middle East, India, and Africa. Lesser flamingos live only in Africa. Flamingos are omnivores, meaning they eat both meat and plant matter. They eat small insects, algae, mollusks, crustaceans, and small fish. The flamingo’s famous pink coloring comes from its diet. The algae flamingos eat is filled with beta carotene, an organic chemical with a reddish-orange pigment. The mollusks and crustaceans that flamingos eat also contain similar carotenoids. Because carotenoid levels vary in different parts of the world, some flamingos are brighter than others. American flamingos are usually the brightest, while lesser flamingos in parts of Africa that struggle with droughts are paler pink. To catch their meals, flamingos use their feet to stir up the bottom of the lake. They then duck their beaks into the water to grab food. Flamingos are social birds who love company. They gather in large groups called colonies or flocks. In East Africa, more than one million lesser flamingos have been known to gather, forming the world’s largest group of birds! The colony works together to protect each other from predators and take care of young flamingos. Flamingos communicate with one another in many ways, including body language and sounds called vocalizations. Their vocalizations include growling, gabbling, and honking. When a male and female flamingo pair with one another, they usually stay together for life. Pairs make nests out of mounds of mud. Females lay one egg at a time. The male and female flamingo take turns sitting on the egg. The egg takes 27-31 days to hatch. At birth, flamingos are gray and white. They don’t turn pink for about two years. The chick stays in the nest for five to 12 days and is fed milk by the mother, father, and sometimes other flamingos. As the parents feed the chick crop milk (which comes from the upper digestive tract), they are drained of color and become pale pink or white. Color returns as the chick becomes more independent. By the time the chick leaves the nest, it can swim and walk. Flamingo chicks spend time together in groups called creches, looked after by a few adults. Adult flamingos can recognize their young with distinctive calls. They visit the creche and continue to feed milk to their children. 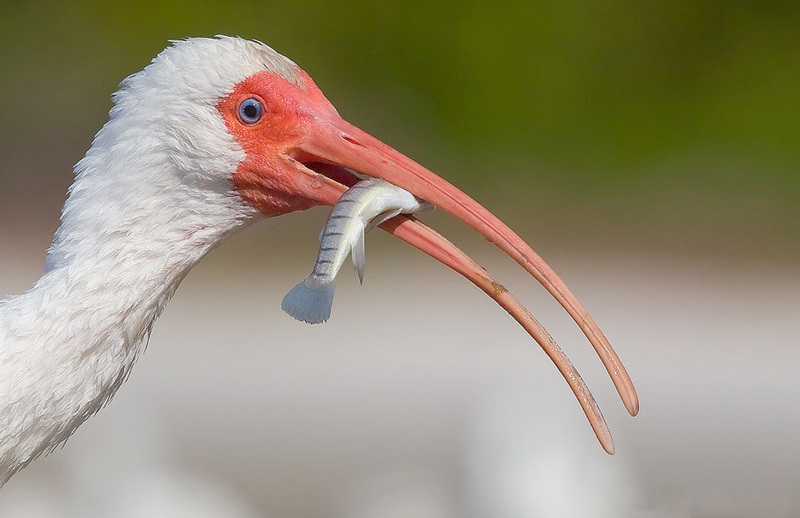 The flamingo population is increasing, and they are not classified as endangered. However, the Andean flamingo is listed as vulnerable, and Chilean and lesser flamingos are classified as near threatened. Flamingos are sometimes threatened by habitat loss. They have few natural predators, but flamingo chicks can be vulnerable to eagles. When food is scarce, flamingos don’t lay eggs. Flamingos have great hearing but very poor senses of sight and smell. 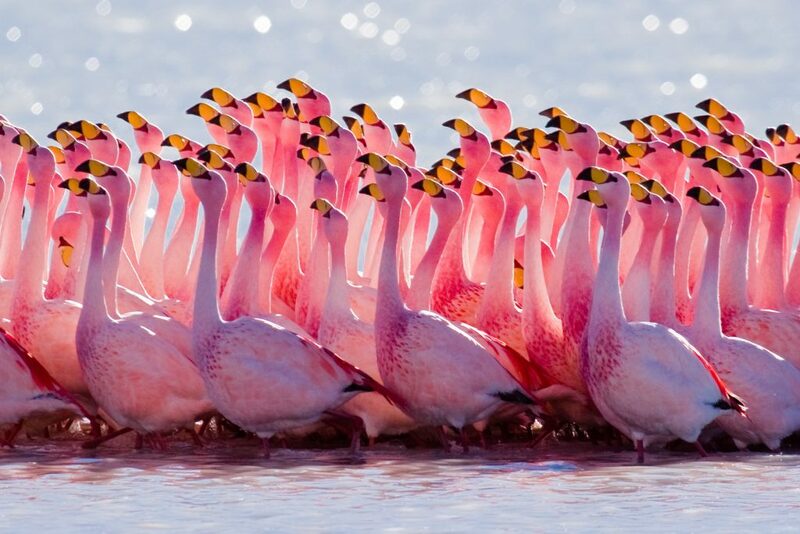 When there is a threat, flamingos move in unison (all together) for protection. In the wild, flamingos usually live for 20 to 30 years. Flamingos are known for standing on one leg, but scientists still don’t have an explanation for this behavior. Some believe that it helps regulate their body temperature. Because of their webbed feet, flamingos can “run” on water before taking off in flight. Flamingos can fly at speeds of 31-37 miles per hour. They don’t migrate, but flamingos may travel to a new location if food or weather is not favorable. They can travel over 300 miles in a single night. View our fun flamingo slideshow!